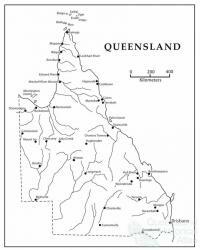 Queensland possesses two Indigenous groups: Australian Aborigines and Torres Strait Islanders. Archaeologists have placed Aboriginal occupation at about 36 to 55 thousand years BP (before present) and Torres Strait Islander occupation in the last 3000 years BP. In ‘precontact times’ these two peoples kept healthy through traditional migration, hunting activity, good diet, plenty of cultural exercise and rest. Europeans, possibly as early as 1522, touched the east and west of the continent and Dutchman William Janzoon explored the western Cape York in 1606, 50 years before the Englishman William Dampier saw the western coast. Most Europeans saw neither good in the land nor the people. James Cook and Arthur Phillip reported Aborigines in good physical health in both 1770 and 1788 respectively. 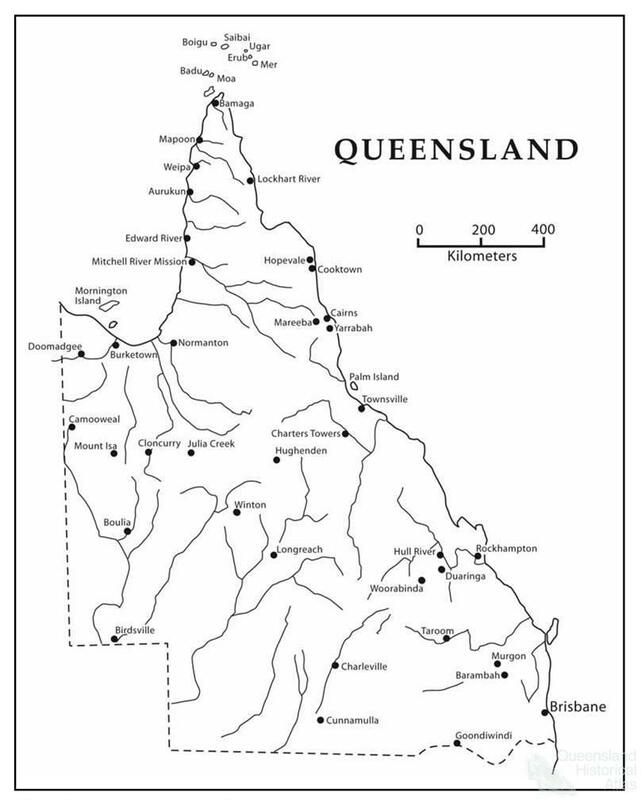 The health, fitness and wellbeing of Queensland’s two Indigenous populations rested on the maintenance of their traditional activities, and food, as well as the slowness of the British establishing a penal garrison in 1823, together with expansion of the British population into the Brisbane valley during the 1840s. Accelerating British expansion westward and northwards from 1850 to 1900 overlaid plummeting Aboriginal medical and health conditions. Pastoral conditions on the mainland affected food, cultural activities and freshwater sources. The effect of traditional migration on Indigenous Peoples' central feature of maintaining good health, and wellbeing, was immediate. Competition with the British for land, food and water saw the development of colonial programs to centralise Aboriginal populations on the mainland onto feeding and medical depots. By the 1850s Aboriginal resistance to British expansion saw the introduction and reliance on ‘native police forces’. Punitive expeditions created massacres across the colony by the 1880s, and known Aboriginal populations dwindled from more than 200,000 in 1839 to 15,000 in 1897, and at the same time, British populations increased. Reports on the deteriorating conditions of life of Aborigines on the mainland including increasing vicious attacks by native police, and pastoralists’ killings of Aborigines, forced the colonial regime to disband the native police and increase protection arrangements for Aborigines. Archibald Meston and Dr Walter Roth were crucial supporters for both protection legislation and Protectors of Aborigines in the last decade of the nineteenth and first decade of the twentieth century. In 1901 Federation occurred where Queensland shared economic, political and cultural legislative powers with the Commonwealth. Control of hospitals, medical services, ambulatory health services and race relations remained with Queensland who repatriated South Sea Island slaves in 1907. Immigration was shared in the interim but control over quarantine was held by the Commonwealth. Plantation labour and infectious diseases began to affect Aborigines on the mainland and the Torres Strait, together with remaining South Sea Islanders. 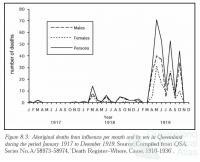 Infections like leprosy, tuberculosis, hookworm, influenza and mental and sexually transmitted diseases began circulating between white Queenslanders and Indigenous rural populations. Missionaries cared for sick Indigenous groups during periodic epidemics in outlying regions and contract nurses and doctors cared for Aborigines on Government reserves or ration depots. By the end of World War I, most bush hunter and gatherers on the mainland were either in contact with missions or on cattle properties as surplus labor and on government reserves. There were also large numbers of Aborigines either on the Palm Island’s government penal or medical establishments for treatment of tuberculosis and leprosy. Some research of Aboriginal health was carried out by the Commonwealth and mortality records were collected by the Queensland Government while primary health nurse-based-clinics were presented on government reserves. Fringe-camp conditions were exacerbating Aboriginal health profiles due not only to scarce government presence in the Cape and Gulf regions but also due to poor living conditions on government depots before World War II. 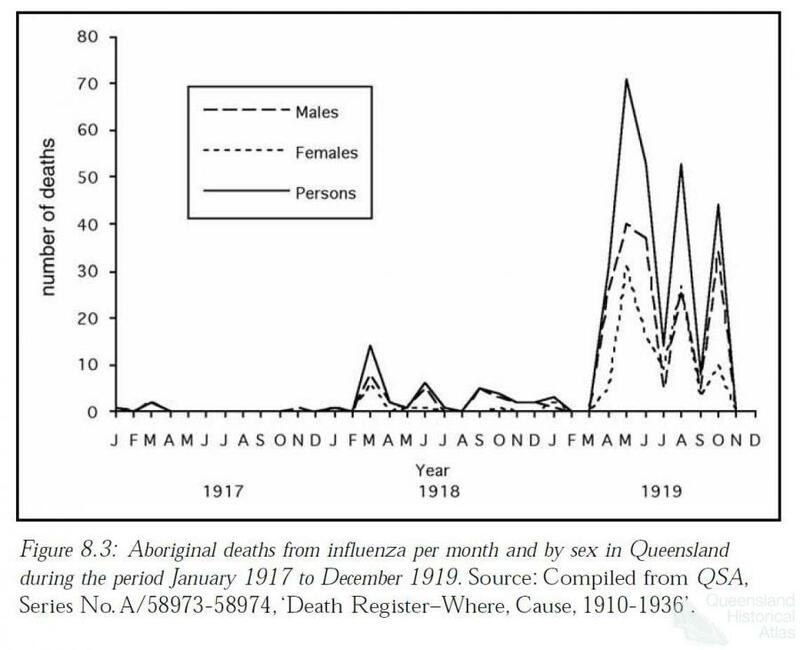 Once events like the 1918-19 Influenza Pandemic came and went. This made arresting epidemics of measles, leprosy, tuberculosis and periodic influenza an almost impossible task - both to bring the sick to hospitals and to carry out follow-up treatment. Added to these difficulties was the dual problem of state ‘user pays primary health’ and overlapping commonwealth public health systems. Between the Wars, State/Commonwealth and international Hookworm treatment made cumbersome programs more difficult. The living conditions of Aborigines were made harder too, with the absence of knowledge of treating viruses such as tuberculosis, leprosy, measles and influenza. These all came under control after World War II with antibiotics. In the Torres Strait the Thursday Island Hospital served the whole Torres Strait region, a position neither pleasing the Indigenous populations of the mainland nor the Islands. In the period from 1945 to the present, greater periodic medical, political and social change bought greater primary and public health changes. The greatest impediment to Aboriginal health was not just that Indigenous peoples were caught in a social, economic and political transition but that their differences were exacerbated by both separate legislations that managed political change; and divided state and federal governance structures. In 1897 the Aboriginal ‘protection’ from colonial ravages came under British legislation called the Aboriginals Protection and Restriction of Sale of Opium Act, 1897. This legislation was without a political movement as its critique and as a result subjugated modern Indigenous societies. In the period from 1949 to the 1960s, Queensland could boast better conditions of life than most Aboriginal communities around Australia. However, the mining boom of the 1970s and 1980s in the Cape region, arrested some economic and social justice change. Change did come during the 1970s-80s, however, as the Commonwealth brought a fresh medical and bureaucratic perspective. Aboriginal health and welfare policies introduced a more equal treatment. Today, while diseases like diabetes, obesity and the effects of alcohol take the place of disappearing ‘protection and assimilation’ policies, lifestyle diseases are replacing both abnormally high Indigenous infant mortality and a plummeting life expectancy. Following close behind these changes in Indigenous health is greater consciousness by all governments to public health.